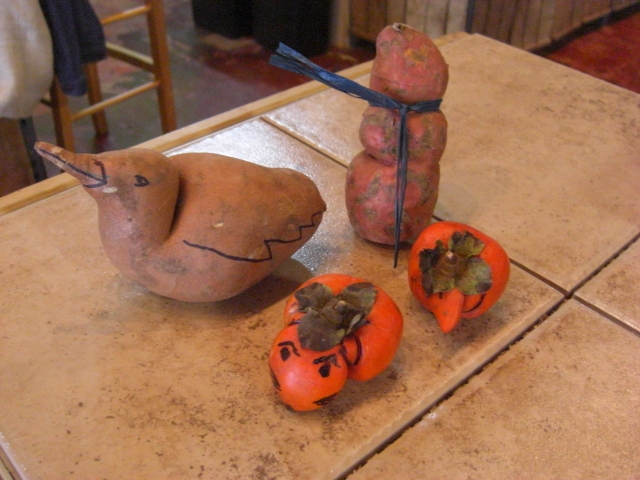 A couple of weeks ago, a little pumpkin came in our CSA box. I know what you’re thinking – that’s a really small pumpkin. 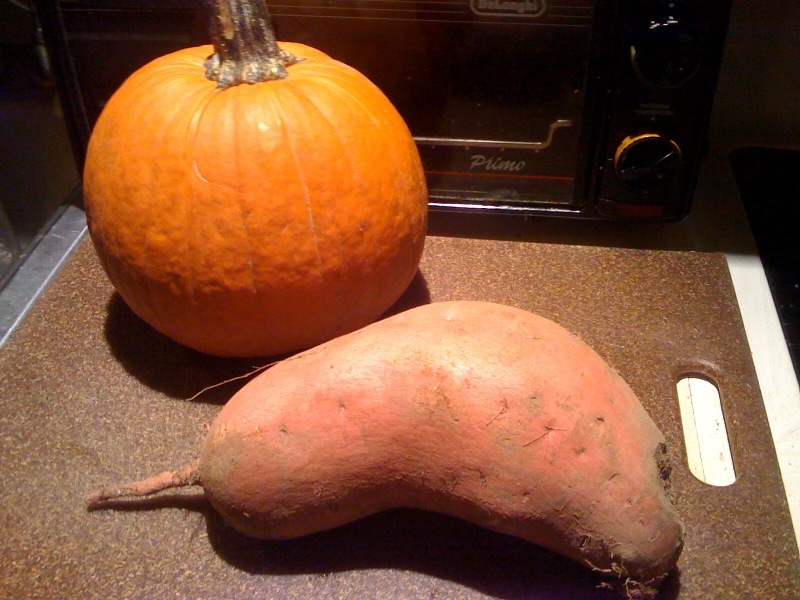 But, actually, that’s an exceedingly large sweet potato. To our surprise, this little guy produced 4 cups of pumpkin puree and nearly one cup of seeds. That’s enough puree to keep us in cream cheese pumpkin bread for the rest of the year! I used to think that the main selling point for Asian turnips was that they weren’t regular turnips. Now I’m becoming fond of them for themselves. 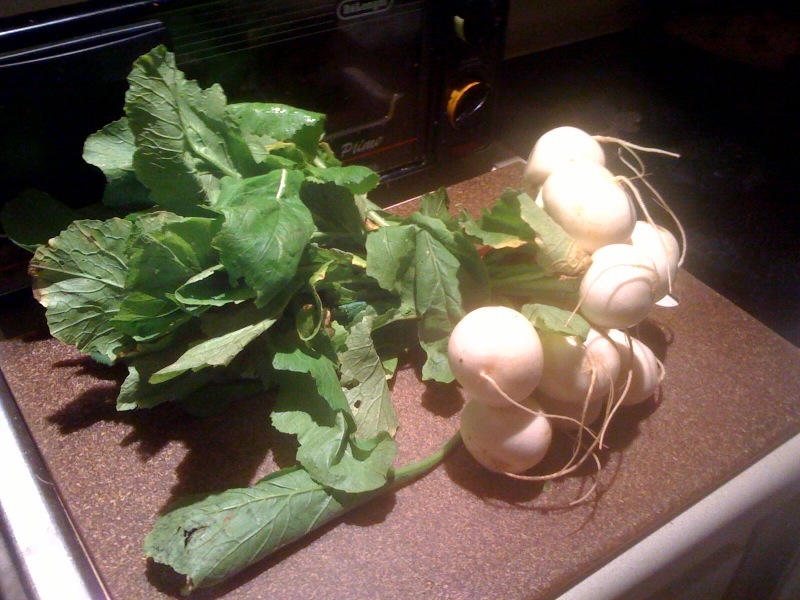 We got this bunch of turnips with greens a couple of weeks ago. I separated the roots from the greens right away. The roots will last in a plastic bag in the crisper, like, forever. They have a mild taste and a nice crisp texture that makes them great chopped up in any kind of salad. They’d also be good in a cole slaw. In a stir-fry, they add a texture that’s sort of like water chestnuts. And the greens are good, too. Like the roots, the greens are smaller and milder than their purple-topped brethren. 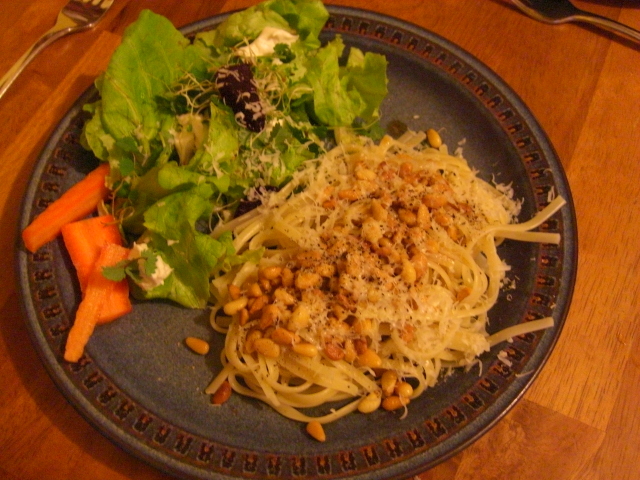 We sautéed ours in olive oil with craisins and chopped walnuts, and we were really happy with the results. It’s always nice when our feelings for a vegetable that regularly appears in our CSA box moves from grudging acceptance to fond welcome. a duck, a snowman, and mice wearing hats? 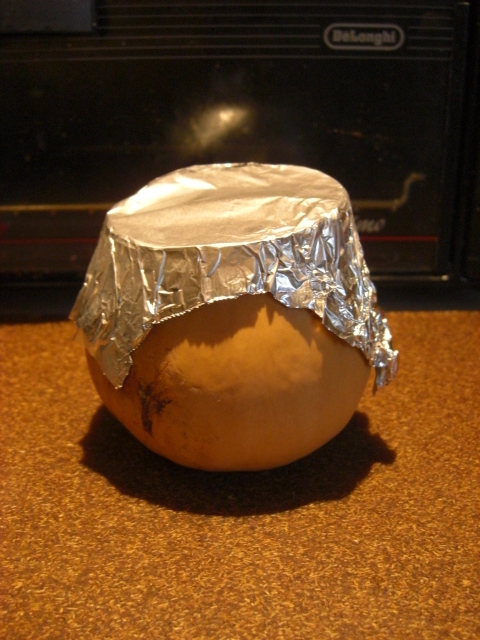 And last night, Chris remarked that our butternut squash bottom looked like a conspiracy theorist wearing a tin foil hat. Of course, right after this picture was taken, he was put in a 350 degree oven for an hour. Salad’s a big part of spring and fall CSA-dom. Here are some of my thoughts on how to get the most out of your CSA salads. 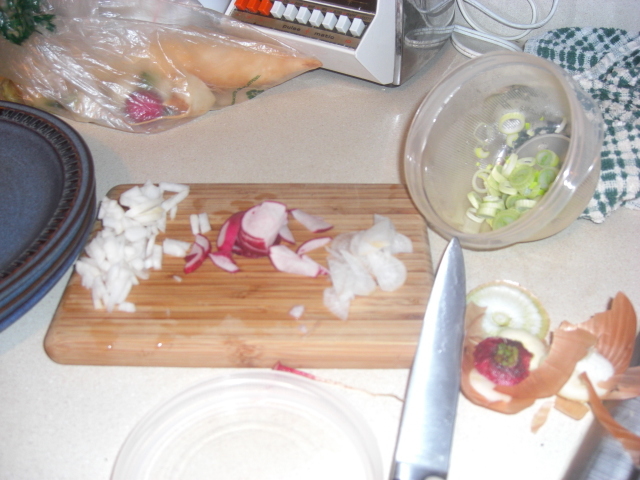 There are two essential salad tools: a salad spinner and a good sharp knife (or two). 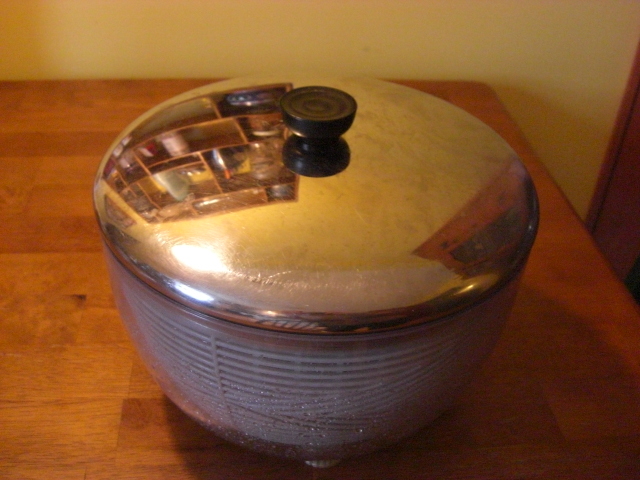 I used to think that a salad spinner was just another kitchen gadget, but it makes salad so much better. Here’s mine. 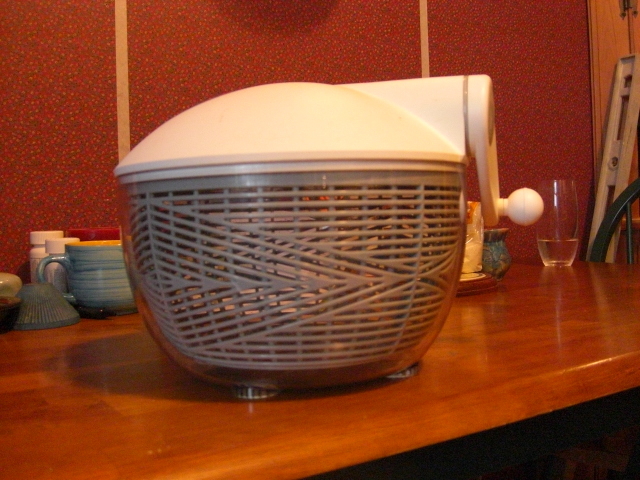 I like my salad spinner because the spinning handle’s on the side and because I have a top that fits it. That way, it’s easier to store in the fridge. 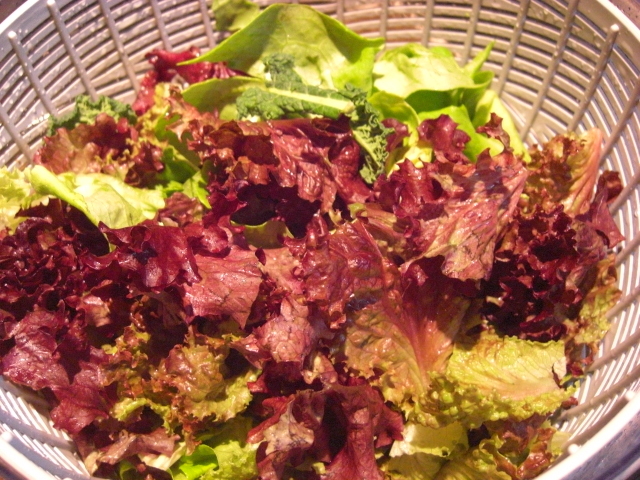 Most of the lettuce from Farmers’ Fresh is hydroponic or leaf lettuce. (Hydroponic is the lettuce with roots that’s grown in a greenhouse.) These types of fresh lettuce are one of the real treats of local food. They’re delicate and full of flavor and would never survive long enough to be sold in a supermarket. Keep this in mind and eat these lettuces quickly; they will never be better. I usually wash mine the first day or so and store it in the salad spinner in the fridge. It’s usually gone in a day or three. Salad can also mean baby spinach, arugula, and even some other greens that might surprise you– beet greens, turnip greens, kale, bok choy, and others. The trick with these greens is to separate the baby from the not-so-baby. 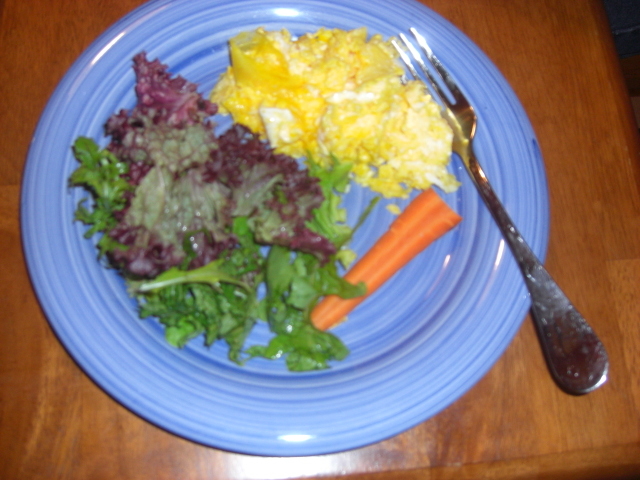 Baby beet greens make great salad; not-so-baby beet greens not so much. If I have time, I separate greens by size on the first prepping day and make a salad mix out of the babies. 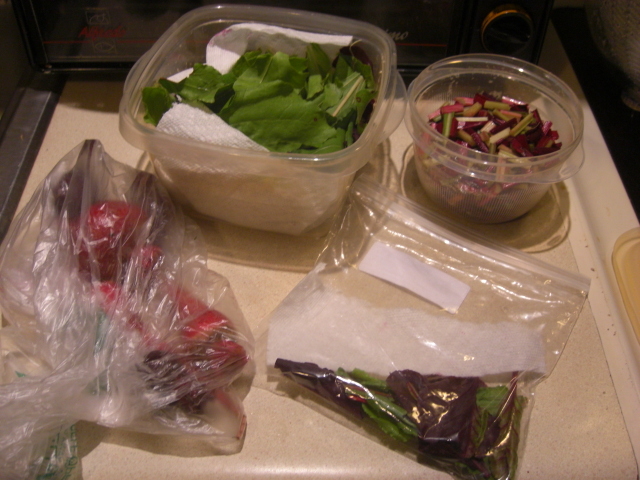 Here’s a pic where I separated the beets, big beet greens, beet stems (for stir-fry, fried rice, or shepherd’s pie), and baby greens for salad. We also get “mixed Asian greens” sometimes. This is usually mizuna, tatsoi, and some other spicy greens. Chris and I like them as salad, but, like with the other greens, you can also braise them or use them in a stir-fry. 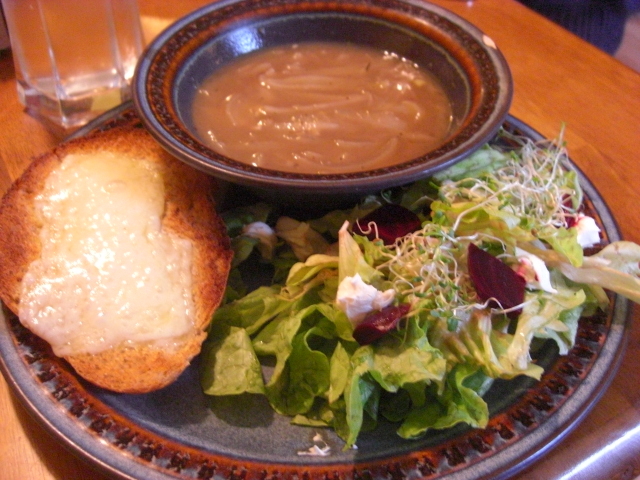 You might also try pea shoots (more in the fall, usually) and watercress in your salads. Just chop ‘em up stems and all and add them to the mix. Pea shoots are kind of sweet and watercress is peppery. 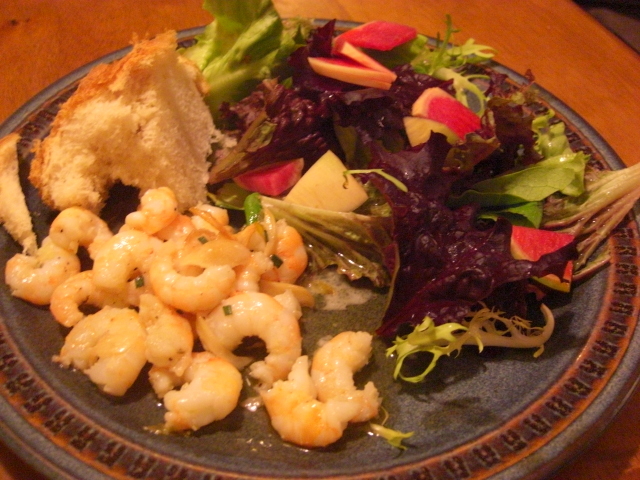 Some herbs go great in salad – usually the tender green ones. Chervil, salad burnet, and parsley are the best. You can also add mints, dill, and par-cel. 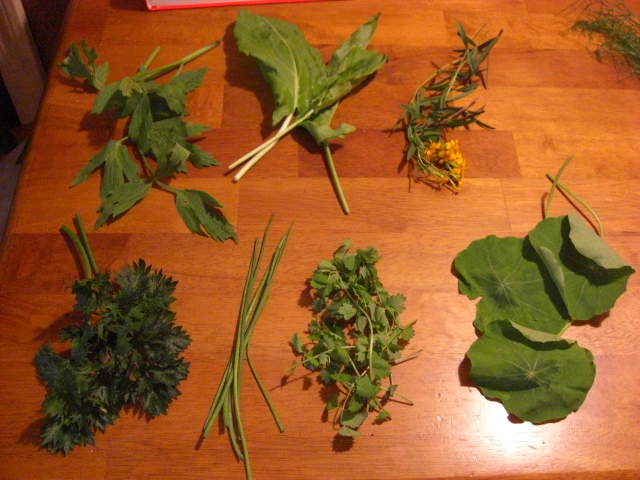 And any herb flowers are good in salad. If you have any doubts, just taste some and see. If I have time, I’ll break off the little leaves off the stems before adding herbs to salad. If I don’t have time, I chop them up with their stems on. And the par-cel stems always get chopped up because they have a nice celery taste. Sorrel (which I love by itself) is somewhere between an herb and a green. Either way, tear up the leaves and add them to salad for a lemony kick. Here’s where that sharp knife comes into play: slicing up salad fixin’s. And some of them need to be sliced thin for the best effect – like radishes and Asian turnips. If you slice these guys thinly, they add a nice spark to a salad. But if they’re too big, they overpower everything else. You’ll also be chopping carrots and green onions for salad, but these don’t need to be as thin. Same goes with other sweet-ish things like roasted beets and strawberries. 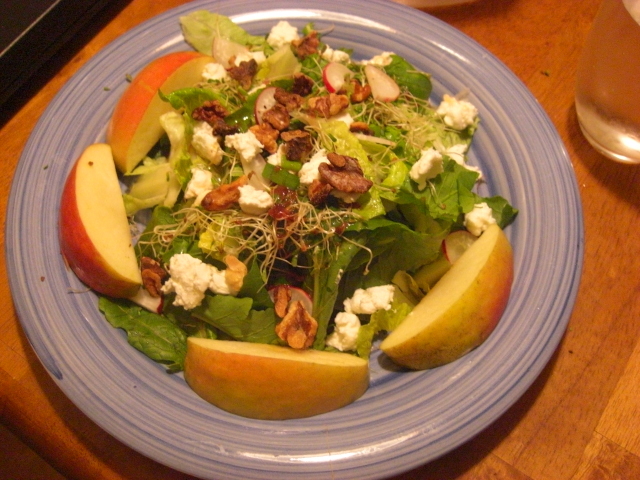 Sprouts are good on salad, too, and need no chopping. It’s so easy to forget the sprouts, though. I’ve learned to pull them out of the fridge with the rest to have the visual reminder to add them at the end. 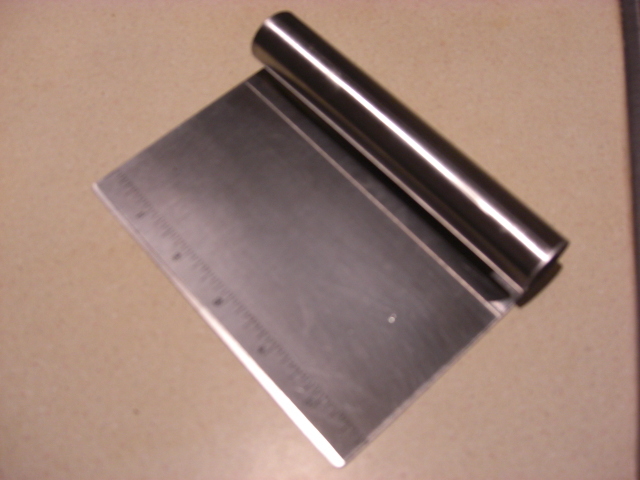 In addition to sharp knives, a little scooper thing can be useful, too, when you’re done chopping. Recently, I’ve gotten really lazy and have been using just (good) vinegar to dress our salads. This is partly because the delicate lettuces don’t do well with oil, in my opinion. It’s too heavy and weighs them down. The stronger greens stand up to oil or a heavy creamy dressing much better. If you have a dressing you like, for sure stick with it. 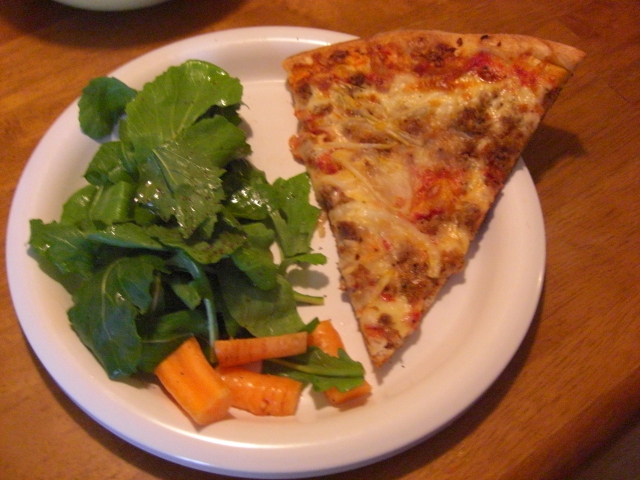 My step-son loves the Good Seasons Italian that you mix up at home, for instance. But it’s also pretty easy to make your own dressings. One of the nice things about dressing is that you can keep tasting it and adjusting the ratios. Of course, if you keep adjusting the ratios, you often end up with more dressing than you intended. Just keep it around for marinade or the next week’s lettuce load. Here’s a bunch of vinaigrette recipes to try. 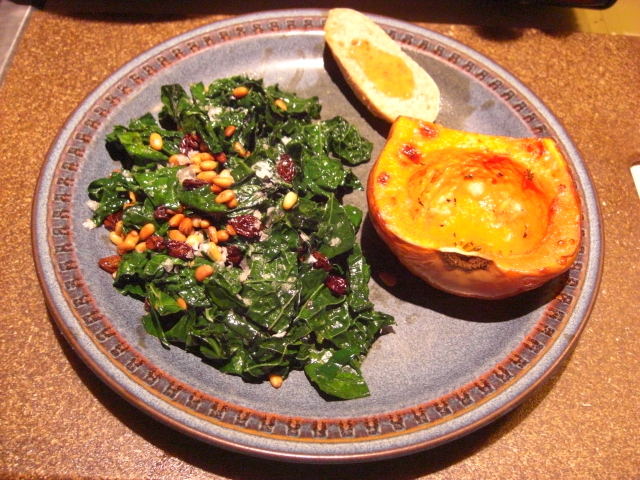 Sweet potatoes (and winter squash) go great with salad. Sausage doesn't hurt either. Goat cheese and toasted walnuts! 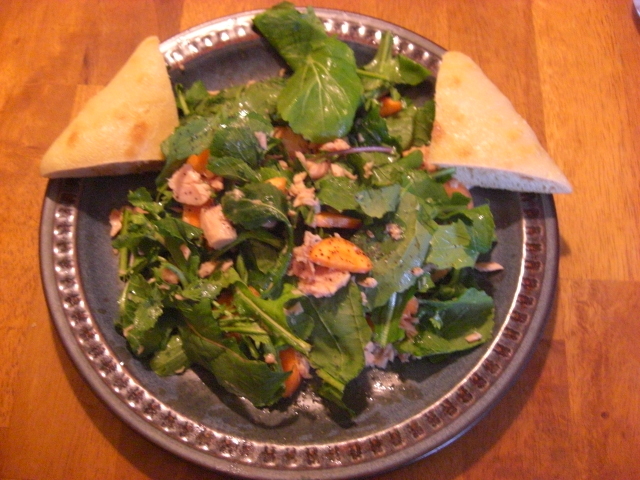 Salad tossed with tuna canned in olive oil! 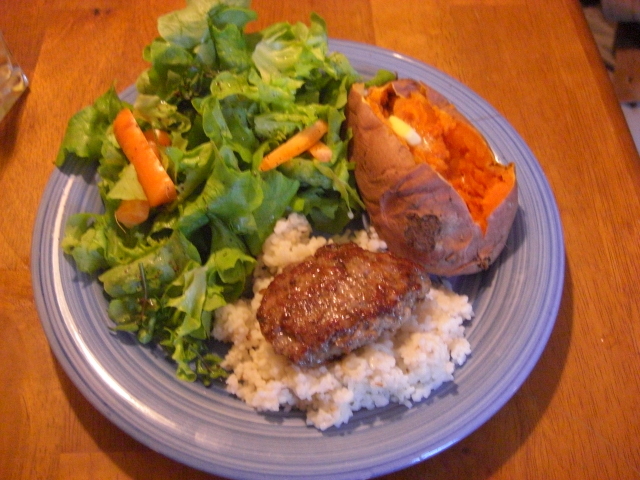 Any cold and leftover protein can be mixed in with salad to make a really nice lunch. Enjoy all these salads while they last. Sure by next month, you’ll be ready to see the back of them. But come August, you’ll start dreaming of them again. Luckily, they’ll be just around the corner come fall.